Volume 9 (2018), Number 2 is published! Volume 9, Number 2 of the journal is published online on December 13, 2018. The corresponding authors will also receive a printed version. This issue brings 15 original scientific papers in the area of operational research. Read More Read more about Volume 9 (2018), Number 2 is published! Efosa Edionwe, Mbegbu J. I., Ekhosuehi N., Obiora Ilouno H. O. All issues are also available at the Hrcak database - Portal of scientific journals of Croatia. 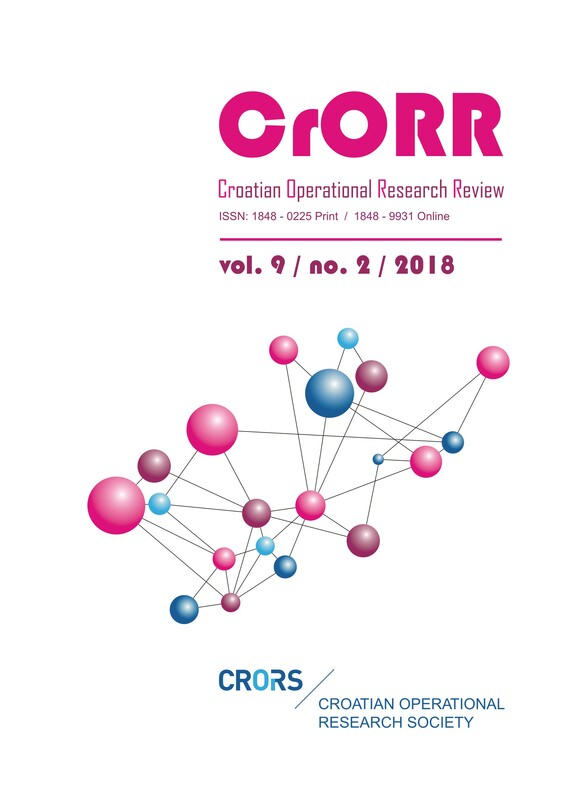 Croatian Operational Research Society, as the main publisher of the Croatian Operational Research Review journal is committed to ensuring ethics in publication and quality of articles. The journal aims to publish only original scientific papers which contribute the area of operational research and related areas. Conformance to standards of ethical behavior is therefore expected of all parties involved: Authors, Editors, Reviewers, and the Publisher. Our Publication ethics and malpractice statement (available in in pdf format) is based on Committee on Publication Ethics (COPE) Best Practice Guidelines for Journal Editors. This is an open access journal which means that all content is freely available without charge to the user or his/her institution. Users are allowed to read, download, copy, distribute, print, search, or link to the full texts of the articles in this journal without asking prior permission from the publisher or the author. This is in accordance with the BOAI definition of open access.The journal has an open access to full text of all papers through our Open Journal System and the Hrcak database. It has been included in the DOAJ (Directory of Open Access Journal). Current Index to Statistics, Current Mathematical Publications, Directory of Open Access Journals (DOAJ), Mathematical Reviews (MathSciNet), DOAJ, EconLit, EBSCO host, Genamics Journal Seek database, Hrcak, INSPEC, ProQuest, Scopus, Zentralblatt fuer Mathematik/Mathematics Abstract, MATH on STN International (CompactMath), Web of Science Core Collection - Emerging Sources Citation Index (WoS ESCI).